February 26th is a day that fairy tales are made of – it’s Tell a Fairy Tale Day. Everyone loves a good fairy tale – kids, adults and animals. It’s a great way to bond with your friends. Pick a story or make up a story. Either way, it’s a great time for everyone! So, cozy up with your selected loved one and read a fairy tale or make up one. You all know that the pampered pig Bacon gets a bedtime story every night when his mom tucks him up. (That pig is *beyond* spoiled!) I asked him to share one of her stories with his friends here and he said this one was his favorite. We hope you enjoy! “Once upon a time there was a four legged hoofed piggy who was adopted by a human family. We’ve all seen Stuart Little. A little mouse that was adopted by the Little family. Well, this family was just about the same. They really wanted a baby of their own but circumstances just didn’t work out. They did the next best thing and adopted a little runt piglet that was only three weeks old. They took Bacon home and created his own little nursery for him, catered to him and taught him how to become a little man. As Bacon grew more and more each day and learned the ways of being a little human, he also grew more and more in his parent’s hearts. They wanted little Bacon to do nothing more than to blossom and be happy with his life. 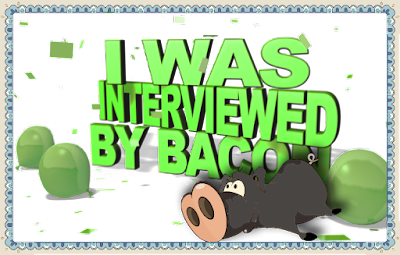 Bacon caught on quick to the human ways and started watching television, surfing the net on his laptop and even created his own blog. In no time, little Bacon became a little pig star in his own right! Bacon adjusted to life at the Hotel Thompson and caught on so well with the schedule of the Thompson clan. He knew when it was time to eat. He knew when it was time to take a nap. He even knew when it was time to go to bed. He created his own little routine before bedtime every night. Not only was Bacon happy at the Hotel Thompson, he brought happiness to the Hotel Thompson. Little Bacon became such a happy part in his parent’s eyes that they couldn’t even remember life without Bacon. He filled a void that his mommy had and made her the happiest mommy in the world. His mommy fully loved Bacon and Bacon fully loved his mommy.